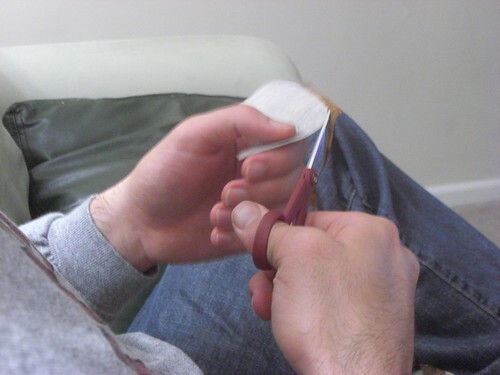 Using the good scissors, originally uploaded by aspiringameliorant. A. has been helping me out with a project this week. He was particularly excited when I let him use the good scissors. Or at least I like to imagine he was. In elementary schools, they often have people from various professions come in and talk to kids about what their job is, how they ended up there, and what a typical day is like (hm, sounds sort of like questions you're supposed to ask in an informational interview). I'd like to start a campaign to get a color-namer come in and talk to me. How does one end up with such a job? Is that all they do, or do they have some other job in the paint factory, fabric mill, or makeup designer's office? Because, you know, I think I might be interested. Case in point. 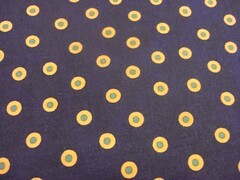 This fabric that I've been working with is from a line called "Cheddar and Poison Green." The best part of it is, it's not even a new fabric that someone just named. These were colonial dyes from the early days of automated fabric production (and quite different from the earliest dyes--browns and rusty reds). What I have is a reproduction (I don't have any 200 year old fabrics in the stash), so I'm guessing it's not dyed with the early natural dyes (some people think poison green refers to the dye's source which was possibly the wormwood tree of absinthe fame). I think the print is great (and great for the project it's going in), but I think the names might make me love it a little more. It's happened before. When I was in elementary school, crazy-colored nail polish was the coolest thing ever. There were a couple of bottles I bought just for the names, particularly "E=mc^2," which, if I recall correctly was blue and sparkly. Anything you love even more because of its name? Invitations, originally uploaded by aspiringameliorant. I love stationery! 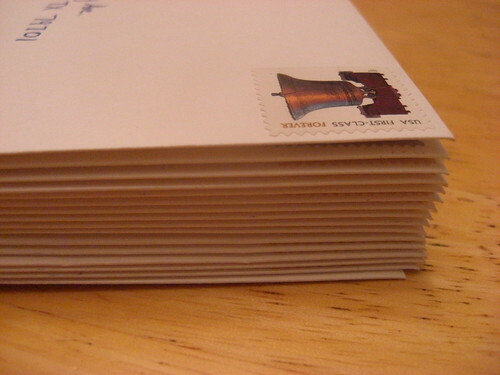 I think addressing wedding invites was one of my favorite parts of the process. This weekend, we went to East TN to visit my parents. 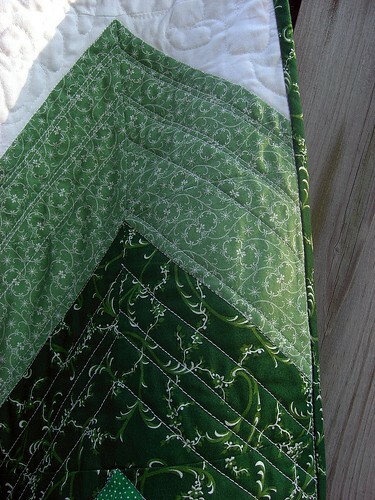 I took this quilt which is just waiting for binding and some final embellishments to work on in the car. Only actually worked on it for an hour though. Even though there are snowflakes on this quilt, I'm not wishing for winter yet. I'd love to have fall stick around for a while! The weekend I went to pick up A. from Boston this summer, we went to the wedding of some college friends. I love weddings! 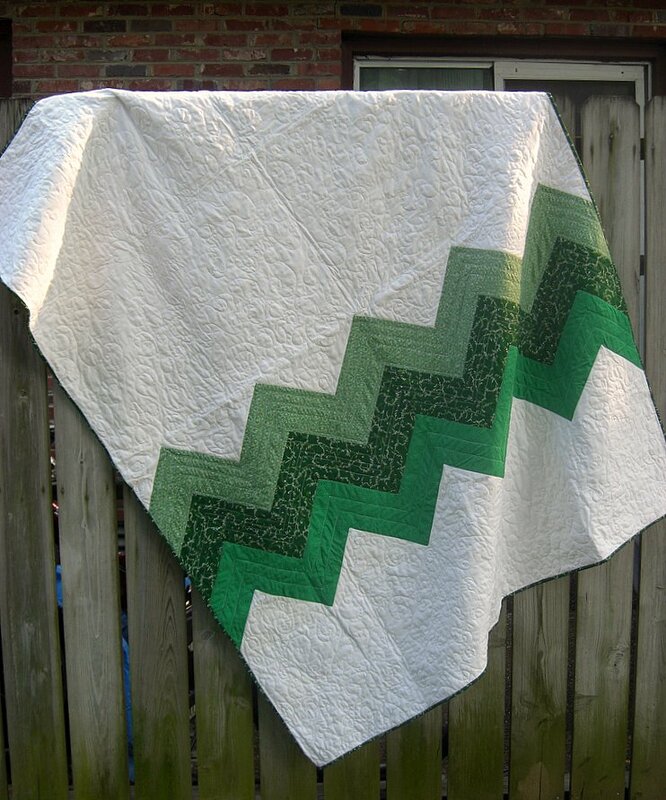 Anyway, I decided sometime way before the wedding that I actually had time to make a quilt, so that's what I wanted to do (note to my friends who got married in '07 or before--want me to make you something? I'd love to! Either ask, or have a baby. Those will both light a fire under me). But then I didn't actually work on it until the week of the wedding. But I had pretty well planned out what I wanted to do, so I managed in a night or two of work. I took the quilt with me to Boston, figuring I'd have plenty of time to get the binding and label sewn on before the wedding. And then I didn't. So I brought it back home. 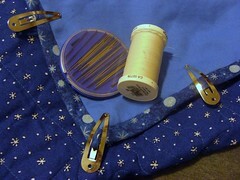 And sewed on the binding. And then waited and waited and waited some more to sew on the label. I finally did it yesterday while watching 'Jeopardy!'. It didn't even take the whole show. Oh well, like I said before, I like to take full advantage of the generous gift giving window for wedding gifts. So now it's wrapped up and ready to wing its way back to Boston. Sorry it's a little wrinkly. I picked green because I'm 80% sure it's the bride's favorite color. Plus the 'Save the Date's were green and white. In a particularly nerdy moment, I decided to quilt the zig-zags themselves in intervals corresponding to the digits of pi. It's approximate, but I think you should be able to make out 3, 1, 4, 1, ... starting from the top. 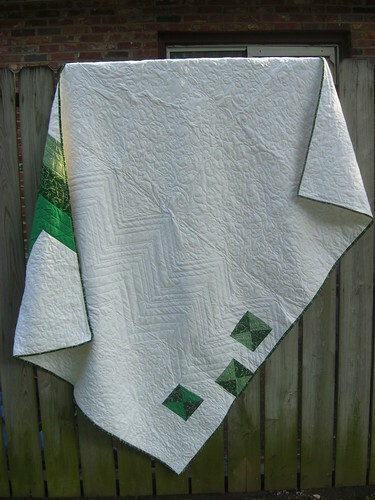 The pictures were taken before the label was on and before it got its final washing (washing a quilt for the first time often gives it that all-over wrinkled look that makes quilts so snuggly), so now it's good-wrinkled instead of bad-wrinkled. I like it a lot for how simple it was. As I alluded to last night, yesterday I tried something I've never done before--namely, punch needle embroidery. I got a punch needle as a prize at my local quilt store when I went on the most recent Mom/Kathy Nashville quilt shop excursion (It was a quiz game. In a fabric store. Could there be anything more appropriate for us? 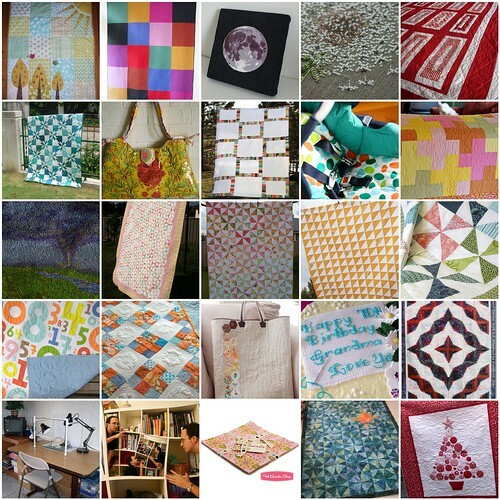 Love the ladies at The Quilting Squares). I always thought punch needle looked like fun. It's kind of like drawing with thread (I suppose that's what embroidery is supposed to be, but this is a more similar action). You punch from the back using the little tool and end up with loops on the front side, sort of like a varsity letter jacket letter. But I could never think of a really good use for a finished product. One can only hang so many pieces of textile craftiness on one's walls before it becomes a little fussy and overly precious (I'm picturing your Great Aunt Mildred with the crocheted antimassacars and lace tableclothes). Like I said before, it reminds me of the patches for letter jackets, but as I'm no longer a Girl Scout my need for badges and patches seems to have decreased. But then I was looking at a tote bag that I got at the Goodwill Outlet. 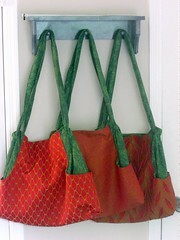 Nice and sturdy, Land's End-inspired boat tote. Except that it has a casino logo on it. Not so cool. 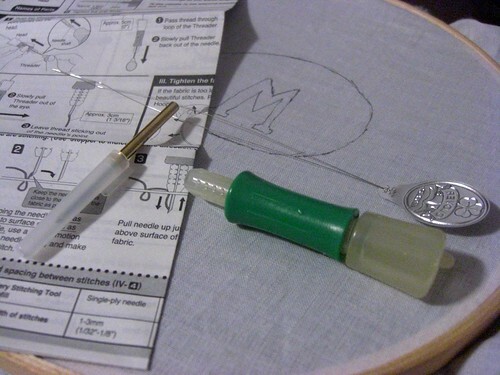 I've been thinking about covering it up for some time now (I love buying those nice giveaway bags for free and then customizing them), but last night when I looked at it, I realized that it was a perfect application for my little patch-maker embroidery tool. It's not great. You can tell from the pictures that the loops are a little bit uneven in height, and the coverage isn't evenly distributed throughout the shape. But it was pretty fast and fun. I found that two strands of embroidery floss worked best, though I might try further experimentation. Anyone got some silly logos that they need covered? E.T.A. I just remembered that I wanted to point out my favorite punch needle piece ever. This woman made a picture of the moon, and it's just awesome! 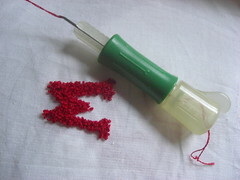 Punch Needle, originally uploaded by aspiringameliorant. 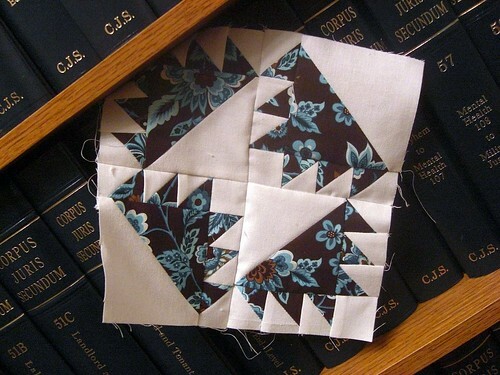 Barristers Block, originally uploaded by aspiringameliorant. An appropriate block to learn before my husband graduates from law school. I'm not sure which name I like more--Barrister's Block or Lawyer's Puzzle. (and points three and four). Interesting how there's no ordinal for decimals, eh? Since my third published idea on ways to use upholstery samples was tote bags, these probably don't constitute a new idea. But I thought I'd share them anyway. 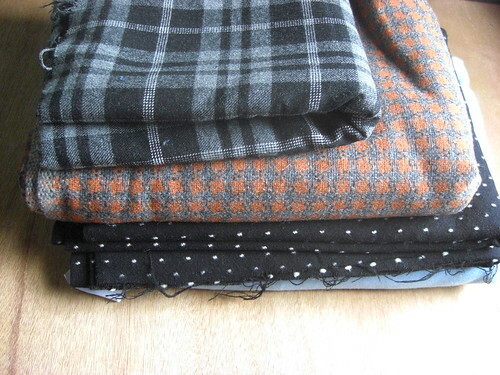 When I got the samples, I immediately noticed four matching/coordinating pieces that were all pretty large. I decided they all had to be used together. In considered a couple other possibilities, but it came down to tote bags. Later in the summer, I became obsessed with the Multi-Tasker Tote by Anna Maria Horner. Interesting construction, side pockets, and a minor crush on the designer (she has fabulous color sense and eight children, and she lives in Nashville--it's only natural I should have a girl crush, right? ), all led to this obsession. 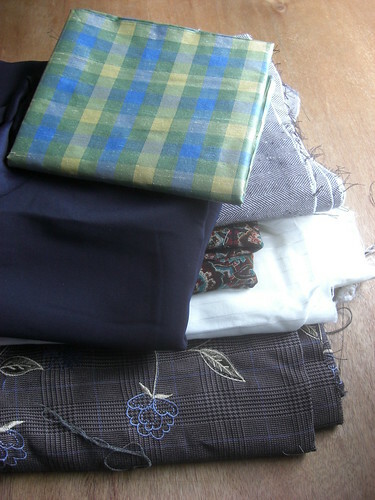 Once I got the pattern, I tentatively tested the pattern on these coordinating samples. One was smaller than I thought, but the rest fit beatifully. The pattern is quite fun and goes together nicely. I actually made most of the lining out of a different fabric, but made a little facing piece so that the tunnel for the straps would coordinate. I would think that if you added a few more pockets and made the lining out of something wipe-able it would make a fabulous diaper bag. I haven't quite figured out why I need coordinating tote bags though. Ideas? Anyone? Because they probably shouldn't sit on my coat rack for too much longer. Today we went canoeing with some friends. The recent downpour meant that the current was moving faster than usual, so we had lots of time to stop and explore side inlets and coves. We swung from a rope swing on the side of the river, found a little waterfall, tried to catch some turtles, and just generally enjoyed the river. The only downside is, it's getting to be fall, and pretty soon it will probably be too cold to enjoy it in quite the same way. But fall has it's own charms, most obviously beautiful fall colors. Tonight I got out some of my jewelry making supplies for the first time in a long time. 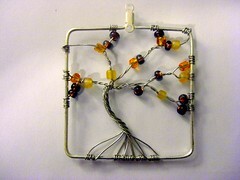 I bought these giant square pendants thinking they would make lovely frames for a tree of life*. So this is my first attempt, with some fall colors to celebrate what is to come. It didn't come out quite as I had envisioned. It's a little clumpy, which I think works out okay for an autumn tree, but would look right otherwise. Also, I think the pendant may just be larger than I will ever wear, but we shall see. Last week I heard tell about an event called "Threadfest." Now, I'm not sure whether I've mentioned it before, but my family? We're festival people. Garlic Festivals, Home shows, RV shows, Coaster Conventions, whatever you can think of. So thread? Festival? Count me in. Notice the cool vintage snowflake print? Wool and Wool Blends (I don't actually know the fiber content of any of this. But it definitely feels like wool). That piece hiding on the bottom is solid light blue. I actually do have project ideas for a lot of these pieces, but realistically know I probably won't get to most of them for a while. 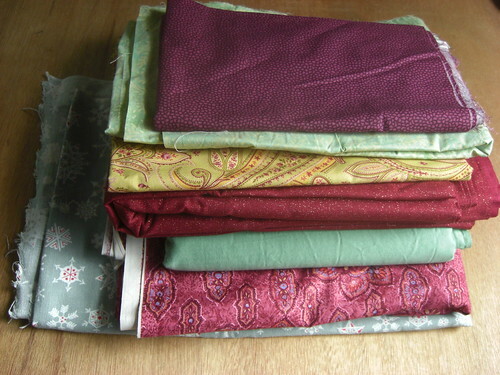 Some sewing bloggers talk about SABLE--Stash Accumulation Beyond Life Expectancy. I don't think I'm there yet, but I suppose I should watch myself! Four mathematicians who do not know each other are invited by a mysterious host on the pretext of resolving a great enigma. The room in which they find themselves turns out to be a shrinking room that will crush them if they do not discover in time what connects them all and why someone might wish to murder them. My husband, being the generous soul that he is, agreed that we could watch it this evening. And it was everything one could have wished for. A grown-up Clue or Mathnet with some classic brainteasers thrown in for good measure. It made me want to host a murder mystery party weekend.